During a heist, New Orleans hitman Roy Cady (Ben Foster) realizes his mobster boss (Beau Bridges) has planned to have him killed. After taking out his would-be assassins, he discovers a young woman named Raquel "Rocky" Arceneaux (Elle Fanning), who was being held captive, and reluctantly takes her with him. 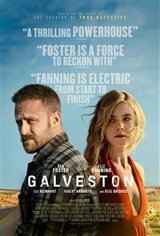 She persuades Roy to pick up her baby sister Tiffany, and with his new wards in tow, he heads to his hometown of Galveston to figure out how he'll keep all three of them safe. Based on the novel of the same name by Nic Pizzolatto.